I recently spent some home leave back in Frittenden. And what a two weeks I chose. I was lucky that I hit the Indian summer during the last 2 weeks of September. But these things pass all too quickly and it seemed that no sooner had I arrived then I was back at Heathrow for the overnight flight back to Lusaka. The flight was uneventful, reasonably comfortable although boring and we touched down 15 minutes late at 6.30am. Second in the queue for immigration and, with no bag to collect, first out of the airport and into the scrum of taxi drivers.”Muli bwanji, muli shani”said I to let them know I wasn’t a tourist “œndifuni Kabulonga” and then the haggling started. One said he would do it for 200,000 Kwacha but we eventually settled for 120,000 and so off to my house. The sun had risen only 20 minutes before but already it was a beautiful morning with a cloudless blue sky and a pleasant temperature of around 25c. Driving up the Airport Road passing the charcoal burners weaving precariously along the road with 6 or 7 bags of charcoal strapped to their bicycles. Into Chelstone, the first suburb on this side of Lusaka, with the roadside now full of pedestrians making their way to work. Whilst I had been away the jacaranda trees had come into full bloom and these magnificent trees were looking splendid covered with their lilac coloured blossom. We turn left off the Great East Road into Kalingalinga where daily life is now in full swing. Kids on the way to school; mamas out buying their basics; the furniture and ironwork makers displaying their wares outside their roadside workshops; the crack, crack, crack of women and children breaking up rocks into smaller stones for construction purposes; those with nothing to do just standing looking and chatting. I am truly back in Africa. After resting for a while I start up the car and drive down to Crossroads shopping mall to restock my fridge with milk, butter, eggs, juice and so on. After shopping I sit at an outside table at Buzz Cafe where they make a decent cappuccino. The 2 young waitresses, Caroline and Kabwe, run over crying “Uncle John, welcome back”. The slightly older and decidedly attractive Mwiza smiles seductively and murmurs “Welcome home Mr John”. Reuben, a fervently Pentecostal waiter, shouts his greeting and dreadlocked Fred working the coffee machine gives me a thumbs up. All of these greetings accompanied with handshakes, hugs and big smiles displaying perfect white teeth in shining black faces. This is so typical of this part of Africa with the welcomes being sincere and genuine and the warmth of the people shines out. I truly feel I am back among friends. So am I back home as so many have said? Well, maybe not “home” but it’s good to be back in this poor but beautiful, peaceful and friendly country. I had always wanted to be called Bwana. It somehow invokes memories of Livingstone, Burton and other intrepid explorers of the Dark Continent. Now, somewhat less romantically, whenever I stop at traffic lights I am surrounded by street vendors asking “Bwana, you buy my bananas?”or apples, papaya, oranges, replica football shirts even puppies or kittens. For some strange reason, Scrabble sets are a popular item for sale as well. As you can guess, I am now in Africa. I left Indonesia at the end of March following the completion of Oxfam’s tsunami recovery programme, spent a few days in Singapore and then flew to Sri Lanka to catch up with friends and places from my time spent working there. I arrived with just a few Singapore dollars in my pocket so went straight to an ATM only to find my card had been blocked. No cash and my Indonesian SIM card wouldn’t work in Sri Lanka so what to do? I jumped in a taxi and went to Sutami’s house in central Colombo. She runs a guest house much frequented by NGO workers where I used to stay when visiting the capital. Fortunately she was at home, lent me enough cash to pay the taxi and use her phone to get my card unblocked. Apparently HSBC’s computer suspected a fraudulent use with my card having been used in Singapore in the morning and then tried in Sri Lanka in the afternoon. I can understand banks need to crack down on card fraud but what would I have done had Sutami not been at home? Lesson learned – let your card issuer know your movements. I was so disappointed to see so many checkpoints on the way from the airport and so many armed troops on the streets of Colombo. The struggle between the government and the Tamil Tigers had obviously intensified in the time I had been away. This in contrast to Indonesia where the horror of the tsunami led to a peace accord between the rebels and government which is still holding. Things were no better on my journey to the south east with the bus stopped and passengers searched some 7 or 8 times on the 10 hour journey. But it was lovely to get back to Akkaraipattu and meet up with friends and colleagues from my time there. I called in at Mahashakti to say hello only to be greeted with “Mr John, while you are here would you help us with our savings and loan system?” It was pleasing to see that a system I had developed with them some 3 years previously was still in use but disappointing to realise I had not given them enough confidence or knowledge to expand it further. But I was happy to spend 2 days with them. Going back to Aragum Bay where I was at tsunami time was a little upsetting too. Yes, the infrastructure had largely been rebuilt and even the new bridge across the lagoon was progressing well alongside the temporary Bailey bridge built by the Indian Army. But there were no tourists and without them the locals are struggling. During my 3 days there I didn’t see another white face. Of course it doesn’t help when all travel advice says not to visit the north and east of this beautiful country because of the war. But other than the military presence and checkpoints I met nothing other than smiles and friendliness. On 26th May I flew to Lusaka the capital city of Zambia to start my new job with Zambart (Zambia Aids related TB Project, www.zambart.org. Zambart, set up in 1994 as a joint collaboration between the London School of Tropical Medicine and University of Zambia School of Medicine, as the name suggests carries out research and clinical trials into the dual pandemic of HIV/Aids and TB. The Zambian government states that 19% of the population are affected by HIV/Aids although most believe, and empirical evidence suggests, the true rate of infection is much higher at more like 30%. With their immune systems weakened, Aids sufferers are of course very susceptible to other diseases and as TB is highly contagious, many victims are suffering both. The emergence in South Africa of drug resistant strains of TB, which is spreading northwards, demands that more research is done. Zambia is a landlocked country lying between the Tropic of Capricorn and the Equator. It’s roughly the size of the UK and France combined and home to 11 million people. Lusaka has a population of 1 million and a further 1.5 million live on the Copperbelt. Thus the rural areas have a low population density and the country retains large tracts of wilderness. UNICEF estimates that some two–thirds of Zambians live on less than $1 per day so perhaps it’s not too surprising that life expectancy averages only 38 years. I guess that also helps explain why almost 50% of the population is under the age of 15. Anthropologists and linguistic experts have identified some 16 different tribes speaking 72 different languages and dialects. Fortunately for me, except in remote rural settlements, English is widely spoken. But these statistics say nothing of the warmth and friendliness that one encounters. Lying on the high plateau that forms the backbone of the African continent, Zambia has an altitude of between 1000m and 1600m which moderates the intense heat of the tropics. At the moment we are just coming out of “winter” (May to August) with daytime temperatures of around 28/30c. Nights have been surprisingly chilly at somewhere between 9c to 12c but at least that means I sleep well. It hasn’t rained since I have been here and from September to November it will stay dry but get progressively hotter to about 35c and then the rains are expected between December to April. Fortunately Zambia is blessed with the greatest amount of water resources in southern Africa and no shortages are expected before the rains come. This part of Africa is of course famous for its game and most visitors will spend time on a safari. Zambia doesn’t have the spectacle of the mass migration seen in Kenya and Tanzania which attracts many wildlife fans but this is a blessing in other ways in that it doesn’t suffer from overcrowding in the parks. But all the large predators are here – lion, leopard, cheetah, wild dog and hyena. Elephant and buffalo occur in large herds and antelope are plentiful particularly impala and puku. I haven’t seen too much myself so far other than a long weekend recently spent in the Lower Zambezi National Park. The 2 guys I went with are keen fishermen so we stayed in a lodge on the banks of the Zambezi in the corner of the country where Zambia, Zimbabwe and Mozambique meet. Much of the day was spent on the river fishing for tiger fish and, although not an avid fisherman myself, it was rather relaxing drifting down river with a rod in one hand and a cold beer in the other. Plenty of hippo and crocodile were evident but perhaps the best time was in the evening when the other animals came down to the river to drink. Lying in bed listening to the roar of lions was quite exciting. For those of us not living on a $1 a day, life in Lusaka is easy and apart from the frequent power outages, not too much to complain about. A good climate, a decent house, plenty of bars and restaurants and supermarkets well stocked with South African products. It’s not cheap however, with prices comparable to the UK and well beyond the reach of the majority of Zambians. After the experience of Shariah Law in Aceh Province of Indonesia, this is a relaxing place. It’s certainly a relief not to be woken at 5am with the first call to prayer. I have neglected my letter writing and my only excuse is that Oxfam expect their money’s worth and work us quite hard. Quite right I hear you say as my costs are being paid by donations from the great British public. So, if you are a donor to Oxfam thank you. Oxfam is doing a great job out here and your money is being well spent. My local parish magazine in Frittenden likes me to do a bulletin every now and again and it’s a copy of that which is attached. It’s a bit of a cheat I know but an easy way for me to give some idea of life out here. I was only in the UK for 2 weeks after Vanuatu so not much time for anything other than a few pints of Guinness. PS. Just to show its not all hard work, I also attach a photo relaxing with some of my Oxfam colleagues. Just in case you wondered, I am the one at the back! I count myself fortunate that VSO gave me the opportunity to live and work in Vanuatu, a country that I probably would never otherwise have visited. Situated in the South Pacific some 1500 miles north east of Australia, it is everything one imagines tropical islands to be. Beautiful palm fringed sandy beaches, warm coral filled seas with myriad colourful fish, jungle, volcanoes and most importantly, wonderful warm and friendly people always with a smile on their face. So it was with mixed feelings that I left. Sad to be leaving but looking forward to the next challenge. I left Vanuatu on January 19th flying into Brisbane and immediately headed north to Mooloolaba where I met up with an ex work colleague who, with his wife, had sold up everything in the UK and were now spending their time sailing around the world. I only meant to stay a couple of days but the opportunity to sail up the coast to Noosa and Frazer Island was too good to miss so I stayed with them for a week. That meant missing out on Sydney and instead heading straight to Melbourne to meet up with my old rugby playing mates most of whom I hadn’t seen for 25+ years. We had a good time and a few beers were sunk whilst exchanging old rugby reminiscences. You’ve probably heard the expression “the older we get, the better we were” and I guess that applied to us. I got back to the UK at the end of January and joined Oxfam on Feb 19th as Finance Manager on the Aceh & Nias Tsunami/Earthquake Response Project. It’s situated in the northwest of Sumatra and is the westernmost part of Indonesia. So here I am now in the town of Banda Aceh and although much larger, it reminds me a lot of Akkaraipattu where I lived in Sri Lanka. Perhaps I feel comfortable in Asia with the noise and bustle, the dirt and rubbish, the smells, the call to prayer etc. Indonesia has a majority Muslim population and in Aceh Province, Sharia law was introduced in 2004 although in a fairly relaxed manner compared to some of the hard line countries. Headscarves are mandatory but women can move around freely without a male chaperone; girls wear jeans and ride scooters; it’s even possible to get a beer in the two Chinese restaurants. But alcohol has to be taken discreetly. The Sharia police will break up parties and arrest perpetrators if there is evidence of hard-core boozing. Drugs are a complete no no. There are currently 2 Brits and a Canadian (not aid workers) in the local jail for smoking pot on the beach and Indonesian prisons you don’t want to be in. If we go swimming at the local beach we have to wear t-shirt and trousers. Fortunately the small island of Pulau Weh is only 40 minutes away by fast ferry. There are no Sharia police on the island so we can get over there at weekends and relax with a beer or two quite openly. The diving and snorkelling is great too with fantastic coral. Aceh Province has suffered greatly over the years. It had managed to remain independent of colonial rule until the Dutch declared war in 1871 which continued for the next 35 years until the last sultan surrendered. In 1953, the Indonesian government incorporated Aceh into the province of North Sumatra angering the Muslims who did not want to be joined with the Christian Bataks so declared Aceh an independent Islamic republic. The ensuing conflict against the Indonesian military lasted until 1959 when the government granted Aceh a high degree of autonomy in religious, cultural and educational matters although keeping a tight grip on Aceh’s natural gas reserves and siphoning off the profits. By 1976 the local Islamic parties had had enough and the Free Aceh Movement (GAM) was formed and began fighting for independence. During the next 30 years the local population suffered from both sides. Army atrocities and human rights abuses were countered by GAM intimidating villages into giving the rebels support. Then came Boxing Day 2004. This area was the epicentre of the earthquake which triggered the tsunami and so suffered a double punch. First the earthquake which toppled most buildings above 2 stories then 20 minutes later the 15m wave which killed 180,000 in the province and 61,000 in the town of Banda Aceh alone. Some 200,000 homes were destroyed and 500,000 left homeless. Some good did come out of the disaster as the government and the rebels signed a peace accord in August 2005 which, unlike in Sri Lanka, is still holding. In fact, in the recent elections, several former rebels were elected to the provincial parliament and one appointed Governor. The disaster devastation is not now immediately apparent. Most of the debris has been cleared away and often the only visible sign of the tsunami is the concrete foundation slabs showing where houses and other buildings used to be or an old wrecked bridge standing alongside the new one that has replaced it. I’m not up to date with tsunami recovery progress in Sri Lanka but I guess it suffers from the same frustrations as here. One problem we, and the other agencies have is spending the money, as things don’t progress as fast as we would like. This is mainly logistical in that supplies and materials have to come a long way and it’s often difficult to get the quality needed. There is also a shortage of skilled labour. One of our housing projects recently came to a standstill over the issue of timber to be used. Oxfam insist on using timber from properly certified sustainable sources (which in this case meant importing from Australia) whereas the local community want to supply the timber giving them income but which of course they can’t get certified as it would be illegal logging. So a bit of a moral dilemma that hasn’t been resolved yet. But there are still 70000 people in temporary transitional accommodation awaiting permanent houses. One benefit of the presence of international aid agencies is the money they pump into the community that acts as a catalyst for the regeneration of the local economy (Oxfam employs some 600 local staff here). So much so that Banda Aceh is now a bit of a boomtown. From what I have seen so far, I believe Oxfam has done, and is doing a fantastic job and more about that in a future letter. But with so much devastation it would be unrealistic to expect everything to be fixed in a couple of years. Thanks for the e-mail re COFOC reunion. That sounds a good idea to me. I’m not sure yet when I will be in the UK but if I am around I would like to attend. I sent out a newsletter a few weeks ago but as I sent it as a bulk mailing it might have finished up in the Spam box so I’ll tell you a bit of what I am doing. I’m still in Vanuatu with VSO. I came out in July on a three month posting yet I am still here although doing a different job. VSO keep finding me different things to do tempting me to stay on which isn’t very hard to do. 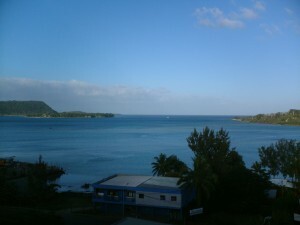 Vanuatu is an easy place to live. The climate is good, about 30c at the moment, with warm seas, beautiful beaches and fantastic snorkeling; the people are friendly and easygoing, the pace of life is pretty slow although that can be frustrating in the workplace. There are problems of course. Its now the cyclone season and one hit the north of Vanuatu a couple of weeks ago but didn’t come down to Port Vila thank goodness. There are 9 active volcanoes – 2 under water – but not on Efate Island where I am. Earth tremors are commonplace and it’s a bit disconcerting to see the cutlery dancing across the table. But I think the major problem will come in the not too distant future. Some 40 percent of the population are under 15. They get a reasonable education and come to the capital – Port Vila, population 30000 – looking for work of which there is very little. Already one can see shantytowns on the outskirts and urban poverty is probably the worst there is. In the villages away from the capital and on the outer islands no one goes hungry or without shelter and they have strong community structures all of which is lost with urban drift. But this place must be an anthropologists delight. The 200000 population is spread out on 83 different islands speaking 106 indigenous languages. Most Ni Van will speak 3 languages: their own village language. Bislama, which is the pidgin lingua franca and either, French or English depending on which educational system was followed. I think the number of languages reflects the diverse origins of the people and also that until recently, contact between communities was not common. If you saw people from the next village you didn’t stop to discuss the price of fish but hightailed it to avoid the cooking pot. The last officially recorded act of cannibalism was in 1969 but rumours abound in the outer islands. PS. I attach a couple of photos. One is the view from my balcony and the other some outer island friends. PPS. Some of us might like the idea of rekindling old flames. This is likely to be my last letter from Sri Lanka as I am due to return to the UK soon. My two years are actually up on the 9th March but I will be working until the end of the month. The project on which I work as part of a team has been going 5 years and finishes on 31st March this year. It seemed right to stay until the end. This project, funded by the European Union, has been all about strengthening the institutional capacity and capability of an all island network of 24 Sri Lankan NGOs so that they can better meet the needs of their beneficiaries. Currently, there is a 3 member independent team of evaluators assessing the effectiveness of the project and I shall be most interested to read their conclusions. Before I met the evaluators, I referred back to the VSO Placement Outline given to me before leaving the UK which identified the key responsibilities of the job. It included the quote, “the successful volunteer will search for opportunities where he/she can contribute most”. After my initial 6 months in the placement, I had a reasonably clear idea of the things I felt should be changed and/or introduced to increase efficiency, management awareness and staff effectiveness. Of course, many of my own goals and targets have not been met and I think I realise now that they were probably too ambitious. I soon learnt that a person having the title of say Finance Director cannot be assumed to have the experience, knowledge or indeed the authority that would be expected of their counterpart in a Western context. This meant that I had to start at a much more basic level than anticipated. Also, things do not happen in Sri Lanka at the speed one is used to in the West. I have from time to time for example agreed objectives or an implementation plan with the appropriate manager but have been unable to convert this to an agreed timetable that has been met. It appears to me that in Sri Lankan culture, people’s faith in their ability to influence the future by following plans is often low. Many are not used to, nor have any experience, with working according to a fixed and documented plan over a period of time. But, whilst one is never satisfied with ones achievements, I finish my placement happy that I have made some little difference to the organisations with which I have worked. So what have I gained personally from my experience? Well, I haven’t been cold for 2 years, I haven’t had to wear a tie and I have bananas, mangoes and coconuts growing in the garden. But probably the most valuable aspect of life as a VSO volunteer is that one lives in, and as part of, the community. One gains insights into the country, its culture, its religions and politics all of which are so different from that experienced in the west and which are not available to the 2 week tourist. This is particularly true for those like me who have spent their time in a more traditional, conservative and rural part of the country away from the distractions of the capital. One experiences life as it is for the majority of the less affluent (i.e. poor) population. I have been particularly fortunate in that all my immediate neighbours have made me very welcome and made sure any problems I have come up against were speedily resolved. I have been welcomed into their homes, shared their joys and their grief and shared their meals. I have been invited to all the social functions such as weddings, coming of age celebrations, funerals and death remembrances. I have made many good friends and I’m certain some of these will endure long beyond my stay in the country. I soon learnt that the pace of work is so much slower than I have been used to and there is certainly a lack of urgency about anything. Consequently I have developed a greater level of patience not previously one of my virtues. It was a little disconcerting at first to discover that sometimes a key member of staff was gone for a few days to attend a marriage, funeral or other family occasion. I have learnt that work is not always the be all and end all of life. Sometimes other things are more important. The most important event in Sri Lanka just recently has been the talks between the government and the Tamil Tigers held in Geneva a week or so back. This is the first time the two sides have met for three years and it is a significant achievement for the Norwegian peace brokers. The ultimate aim must of course be the replacement of the current cease fire agreement with a permanent peace settlement. The two sides remain so far apart in their aims that it was unrealistic to hope for a major breakthrough at the talks. The good thing that came out of the them is an agreement to meet again in April with the two sides agreeing to restrain from violent activities in the meantime. But the killing yesterday of two LTTE members by government forces has caused the Tigers to question the governments sincerity in moving forward. Certainly we all rejoice in the markedly reduced level of killings and bombings that have been apparent since the Geneva talks were announced. Locally in Akkaraipattu, the LTTE and the leaders of the Muslim community met and agreed to cease all violence and to lift all restrictions on movements between the Tamil and Muslim sides of town. This agreement is holding and security measures in town have been relaxed. With no killings or other incidents for three weeks now, this is the longest period of non violence I have experienced in my time of living in the town. are now planning to be here on the 3rd April for a couple of weeks and I hope to travel back with them. I’m obviously looking forward to seeing them again and showing them something of the country that has been my home for the last 2 years. There is a Colonial era establishment in Colombo called the Grand Oriental Hotel although it’s not so grand nowadays. It looks out onto the Indian Ocean and over a busy harbour that in its time has seen the arrival of Arab, Portuguese, Dutch and English colonists. Urban legend has it that if you sit in the lobby for long enough, anyone of any importance in the world will pass by. So, see you there… if not, I look forward to meeting you all again when I get back.